December 18, 2011 - Air Transat, a Montreal-based airline, is the world's first certified green airline. The certification named Fly-360-Green consists of a comprehensive rating system for the design, innovation and operation of highly sustainable airlines and airports. Developed by the World Green Aviation Council, formerly known as Greenhorizon Aviation, Fly-360-Green is intended to provide the airline industry and the airports with a concise framework for identifying and implementing collaborative and measurable green aviation designs, innovations, and operations solutions. With over 55 different environmental initiatives in the three main categories found in the Airline Environmental Management Framework to combating climate change: Daily Operational Activities, Corporate Environmental Management Practices, and Corporate Policies/Strategic Planning; airlines and airports can qualify for three levels of certification: A-class: Over 110 points, B-class: 100-109 points, C-class: 90-99 points for airlines, and A-class: Over 60 points, B-class: 50-59 points, C-class: 40-49 points for airports. The World Green Aviation Council consists of member airlines and airports from around the globe in a simple mission of fostering the international standard for sustainable aviation through cutting-edge technological advancements whilst also taking into consideration aviation's absolute emissions which are constantly on the rise despite various pro-environmental actions taken by stakeholders. "We are very pleased to be announcing that Air Transat is the first green certified airline," says Kharam Singh Khalsa, CEO at World Green Aviation Council. 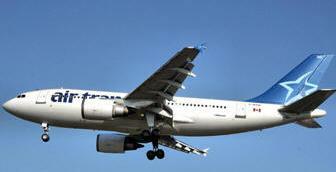 "Air Transat recognizes the prime importance of sustainability and this can be seen through their Fly-360-Green? results totalling over 110 points and qualifying them for the top class certification level in the program - the World's Official A-Class rating" describes Mr. Khalsa. We congratulate Air Transat on its green airline achievements. Air Transat, a subsidy of Transat A.T., and the third largest airline in Canada after Air Canada and Westjet, carries some 3 million passengers yearly to nearly 60 destinations in 25 countries. Air Transat's vision is to continuously reduce its ecological footprint whilst at the same time maintaining the overall reputation for accessible vacation travel. Fly-360-Green Airline Certification - Fly-360-Green is a comprehensive rating system for the design, innovation and operation of highly sustainable airlines and airports. The rating consists of over 55 different environmental initiatives in the three main categories found in the Airline Environmental Management Framework to combating climate change: Daily Operational Activities, Corporate Environmental Management Practices, and Corporate Policies/Strategic Planning. The World Green Aviation Council will be hosting world's first World Green Aviation Week third week of August 2012 in Toronto (from 20 August to 24 August) and also officially launching this council on the 20th of August 2012 (first day of the Green Aviation Week) along with the presentation of the WorldGAC Leadership award to Air Transat as well.